The contemporary design-led 130-room Fitzwilliam Hotel features in the 2010 Conde Nast Traveller Hot List and is a member of the Preferred Hotels and Resorts consortium. It has four meeting rooms: Conference Room East and West each seat 14 people, the Boardroom caters for 20 and the Assembly Room has capacity for 55. The hotel boasts views across the city to the Belfast Hills. Food is sourced locally and the hotel bar's top mixologists can create original cocktails for evening events. Mobile phone giant O2 is a repeat customer and manager Jonathan Christie says: "The facilities are second to none in Belfast. We will continually use them because we find their service exceptional." The five-star Merchant Hotel in the Cathedral Quarter of Belfast has just unveiled a £16m extension. As well as a new spa and 38 additional guest rooms, taking the total number of rooms to 64, the venue now offers six new event spaces with a maximum capacity of 300 delegates. The hotel is housed in the former headquarters of the Ulster Bank, which was built to be "elegant, substantial and prosperous" - characteristics the hotel still retains. Jim Cummins, managing director of wine and spirits distributor Dillon Bass, hosted a meeting at the Merchant in August. "The new meeting rooms are fantastic and we were very privileged to be one of the first companies to use them," he says. "As ever, the food and service provided by the conferencing team was first rate." Part of the Hastings Hotel Group, which also operates the Europa Hotel in the city centre, the Culloden is situated just outside Belfast, in the Holywood hills. It boasts 12 acres of gardens and views of Belfast Lough and the County Antrim coastline. Pitching itself as one of the country's most luxurious properties, the five-star hotel offers 105 rooms and is close to the 18-hole Royal Belfast, Ireland's oldest golf course. The spa was recently extended and features eight treatment rooms and two relaxation suites. Event spaces include the Stuart Suite, which can seat 600 diners, and the Highland Business Centre, which has a range of boardrooms for up to 60 delegates. The Hilton Belfast is located on the banks of the Lagan River overlooking the historic Harland and Wolff shipyard, where the Titanic was built. It has 198 rooms and nine meeting rooms. The largest, the Lagan Suite, can house 450 delegates theatre-style, while the Tower Suite seats 12 people boardroom-style. PWC London programme implementation executive Nicola Blackmore says: "I recently held a three-day conference at the Hilton Hotel Belfast. The facilities were contemporary and fresh and added to the polite and welcoming staff who ensured our conference ran smoothly." 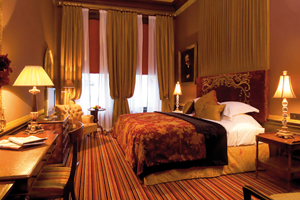 The Malmaison Belfast is the smallest of the hotel group's 12 luxury properties. Located on Victoria Street, just three miles from George Best Belfast City airport, the hotel occupies a former seed warehouse dating from the 1870s and is an imposing Grade-A listed building. It offers 64 rooms comprising 38 double or twin rooms, 24 superior doubles and two suites named Samson and Goliath. A private dining and meeting space is available for up to 22 guests and, as well as being kitted out with AV equipment for business events, it boasts a small Veuve Clicquot Bar for receptions and dinners. The chic boutique 23-room Ten Square Hotel will open a new meeting room, the Heritage Suite, in December 2010. The space will seat 200 delegates and will complement the existing Porcelain Suite, which seats 200 guests theatre-style. The listed property is conveniently situated in the middle of Belfast's financial district. Colin Sanderson is managing director of a travel consultancy company and in April 2010 he hosted a training event for tour operators and tourist boards at the hotel. He chose Ten Square for the event following a recommendation. "All the members were impressed with the facilities and levels of service," he says.